Crushpad, the world’s leading small-lot, custom crush facility, has launched a new contest that allows wine lovers the chance to make their own wine, create their own brand and in the process win one barrel (25 cases) of extraordinary, luxury-class wine. The total value of the prize is worth between $ 8,000 and $ 12,000. 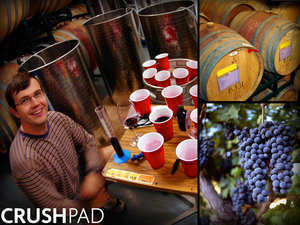 Interested participants can click on the contest link at www.facebook.com/crushpad. There they will fill out a simple form that asks for the basic details of their wine project including brand name, wine style (region, varieties, type of oak), target audience and how they will market and sell their wine. Participants will be able to choose from a range of red wine varieties including Cabernet Sauvignon, Merlot, Syrah, Zinfandel, Pinot Noir and Petite Sirah. They can also designate fruit sourcing from the company’s amazing portfolio of California’s most celebrated vineyards including Doctor’s (Santa Lucia Highlands), Stagecoach (Napa), Konrad (Mt. Veeder), White Hawk (Santa Barbara), Teldeschi (Dry Creek), Eaglepoint Ranch (Mendocino), Durell (Sonoma Valley) and Saralee’s (Russian River). After filling out the simple forms, participants are encouraged to have their peers, associates, friends and family vote for their wine brand plan on Facebook. The voting closes on March 31, 2012. The top 10 vote getters will move on to the final round where they will be interviewed by phone and Skype by a panel of industry experts who will select the grand prize winner based on originality, creativity and chance of success for the brand. The award will be announced on April 25, 2012. The winner will work with Crushpad’s top-flight winemaking and graphic design teams to ensure the wine is being made to their specifications and packaged to meet their criteria. After the wine is aged and bottled the winner can either keep the 25 cases or work with Crushpad to market and sell the wine.